Zooarchaeology of the Historic Cod Fishery in Newfoundland and Labrador, Canada Matthew W. Betts1,*, Stéphane Noël2, Eric Tourigny3, Mélissa Burns4, Peter E. Pope4, and Stephen L. Cumbaa5 Abstract - Allometry and growth-increment aging of archaeological fish remains has the potential to reveal much about past fishing strategies, fish processing and trade, and fish populations. This paper documents the age and size characteristics of four samples of Atlantic cod (Gadus morhua) bones from early European contexts at Red Bay, Ferryland, Bay Bulls, and Crouse, which collectively span the middle 16th to early 19th centuries AD. The samples, which document the size structure of the “fished” population (the death assemblage), allow for a comparison of fishing strategies and techniques between the early Basque, French, and English commercial operations. At the same time, the samples, derived from multiple fishing regions around Newfoundland and Labrador, provide an important record of cod populations during early stages of the commercial fishery and thus offer a critical baseline record against which to compare modern handlined cod population data. 1Archaeology and History Division, Canadian Museum of History, 100 Laurier St., Gatineau, QC K1A 0M8, Canada. 2Laboratoires d’archéologie, Département des sciences historiques, Université Laval, Québec City, QC G1V 0A6, Canada. 3School of Archaeology and Ancient History, University of Leicester, University Road, Leicester, LE1 7RH, UK. 4Department of Archaeology, Queens College, Memorial University of Newfoundland, St John’s, NL A1C 5S7, Canada. 5Canadian Museum of Nature, PO Box 3443, Station D, Ottawa, ON K1P 6P4, Canada. *Corresponding author - Matthew.Betts@civilisations.ca. Introduction Responding to Pauly’s (1995) cautions regarding the “shifting baselines syndrome” in ecological research, where baseline parameters for population health are biased by historical impacts and the depth of historical records, archaeological data have increasingly been incorporated into fisheries research. Of particular interest for researchers working in the Atlantic provinces and adjacent states is the investigation of archaeofaunas in order to contribute to our knowledge of Atlantic cod (Gadus morhua) populations and exploitation strategies. Zooarchaeological data have been employed to track the development of early cod processing, trade, and consumption (Amundsen et al. 2005; Barrett 1997; Cumbaa 1981; Edvardsson et al. 2004; Hodgetts 2006; Noël 2010; Perdikaris and McGovern 2007, 2009; Stevens and Cumbaa 2007; Tourigny 2009), and specifically to estimate size- and age-based parameters of ancient fish populations (Betts et al. 2011; Edvardsson et al. 2004; Jackson et al. 2001; Perdikaris and McGovern 2007, 2009; Rojo 1986, 1987, 1990; Spiess and Lewis 2001). These latter studies, in particular, have provided good baseline indications of preindustrial fish population parameters, and some have attempted to compare these directly to modern fisheries data. Unfortunately, limited historical archaeological data exists to track the impacts on cod populations caused by the rapid development of the historic cod fishery; an exhaustive search of the literature indicates only one published study to date has attempted to reconstruct size-based indicators of cod populations from an historical archaeological site in the Atlantic Provinces (Kenchington and Kenchington 1993). Size- and age-based indicators are critical measurements in the documentation of fisheries populations (Reiss 1989), especially in relation to climatic, ecological, and human impacts (Jennings et al. 2002, Shin et al. 2005). Climatic changes can affect reproduction in fish populations that are strongly temperature sensitive; the resulting fluctuation in the numbers of juveniles in the population can affect length and age structures. Fishing is size selective, with most commercial techniques targeting the removal of larger fish from populations. Differences in exploitation techniques can have strong impacts on the average size and age of fish taken from a population. Fishing pressure can also cause changes in the average size of fish populations. For Atlantic cod, intense fishing pressure which removes large fecund fish from populations is believed to force evolutionary changes reflected in smaller size at age and age/ size at maturation (Andersen et al. 2007, Swain et al. 2007; but see also Bianchi et al. 2000, Rochet 1998, Trippel 1995). Concomitantly, reductions in fish size in archaeological samples have been interpreted as a result of fishing pressure (Amorosi, et al. 1994, Betts et al. 2011, Jackson et al. 2001, Perdikaris and McGovern 2007, Van Neer et al. 1999). This paper uses archaeofaunal assemblages of Atlantic cod bones to track shifts in the size and age structure of Atlantic cod populations from historical archaeological assemblages on the north and east coasts of Newfoundland and the south coast of 2014 Journal of the North Atlantic No. 24:1–21 2014 Journal of the North Atlantic No. 24 M.W. Betts, S. Noël, E. Tourigny, M. Burns, P.E. Pope, and S.L. Cumbaa 2 Labrador (Fig. 1), collectively spanning the middle 16th century to the early 19th century AD. The samples here derive from an inshore fishery, where cod were captured within a day’s travel from shore in small boats utilizing handlines and jigs, then processed, salted, and air-dried on shore for export to markets in Europe and the Caribbean. We assess shifts in the size and age structure of these fish against multiple factors, including climate change, differences and shifts in fishing techniques and technology, shifts in exploitation pressure, differences in archaeofaunal context and collection methods, and regional differences in cod populations. Sample Description The research described here draws data from eight distinct archaeological assemblages spanning the middle 16th century to the early 19th century AD, distributed along the southern Labrador coast, the northeast coast of Newfoundland, and the Avalon Peninsula, roughly corresponding with the southern inshore range of northern cod (Figure 1). The contexts are all derived from locations where significant historic inshore cod fishing operations were conducted, and most of the contexts are the direct result of commercial cod processing (Table 1). Red Bay - Shore Trench, 24M Red Bay is a small, well-protected harbor on Labrador’s southern-most shore. Prior to the 19thcentury, it directly accessed right and bowhead whale migration routes in the Strait of Belle Isle. The harbor contains the remains of several Basque shipwrecks and submerged deposits, and the adjacent shore contains hundreds of archaeological features relating to Basque whale- and fish-processing activities (Grenier 2007; Ringer 2007; Stevens and Cumbaa 2007; Tuck 1982, 1983; Tuck and Grenier 1981). The 24M archaeological site at Red Bay contains the wreck of a 16th-century whaling vessel, probably the San Juan, which sank in a storm in 1565 (Bernier and Grenier 2007:303–308). Associated with the ship are several other sunken vessels and shoreside Figure 1. Map of Newfoundland and Labrador, showing archaeological sites and NAFO Fisheries Regions mentioned in the text. Journal of the North Atlantic 3 2014 No. 24 M.W. Betts, S. Noël, E. Tourigny, M. Burns, P.E. Pope, and S.L. Cumbaa archaeological contexts most likely related to the seasonal cod fishery and whaling activities (Ringer 2007). The cod remains sampled for this study were derived from 24M190M and 24M192M, underwater excavation units on the southern end of the “shore trench”, a 2-m-wide trench excavated between the 24M wreck and the shore to establish stratigraphic continuity between the San Juan and the land-based archaeological deposits. Atlantic cod remains were so abundant in the shore trench that they formed a distinct layer more than 10 cm thick extending from the shore approximately 26 m into the harbor (Stevens and Cumbaa 2007:193, 195). Embedded in the layer were 16thcentury objects of Basque origin, indicating that cod processing on a large scale occurred contemporaneously with Basque whaling (Cumbaa 1981:26). The cod layer was collected by hand; sediment was fanned away by hand and then suctioned by an airlift operating ≈30 cm above the level of the deposit. The quiet, clear waters of the harbor enabled all bones and artifacts to be collected by hand and bagged, resulting in a virtual 100% sample where little size sorting could have occurred. There is a small possibility that extremely small bone fragments could have been vacuumed up by the airlift which was used to suction and remove suspended sediment; however, only fragments small enough to have become temporarily suspended in the water column could have been vacuumed, and such fragments would be much smaller than would have fit through standard fine mesh screen (3 mm). Cumbaa (1981) and Stevens and Cumbaa (2007) conducted extensive analyses on these remains, revealing that the cod-element distributions were dominated by bones from the head and abdominal vertebrae, while they were deficient in caudal vertebrae, fin rays, and elements of the pectoral girdle (e.g., cleithra, fin spines, etc. ; Stevens and Cumbaa 2007:197). This evidence is strongly consistent with the detritus from a shore-processing stage that extended into the water and produced an end product of split, dried cod. Of note is the fact that a significant amount of cod bone was recovered in the San Juan itself, the majority of which was interpreted as intrusive remains from shore fish processing Table 1. Description of archaeological sites used in this study, their respective archaeofaunal samples, and the length (in mm) and age (yrs) measurements from each. Red Bay Red Bay Early Ferryland Late Ferryland Context shore trench shore trench Mansion House Mansion House Bay Bulls Description Fishing stage Fishing stage Domestic stable/ Domestic midden Fishing stage midden Calendar age (A.D.) Ca. 1565 Ca. 1565 Ca.1625–1650 Ca. 1650–1696 1696 Century Middle 16th Middle 16th Early 17th Late 17th Late 17th Element Premaxilla Anterior abdominal Anterior abdominal Anterior abdominal Anterior abdominal Measurement Ascending process* Vertical diameter Vertical diameter Vertical diameter Vertical diameter Mean fork length 806.2 803.09 787.09 762.86 753.29 Median fork length 766.87 771.65 780.4 723.94 740.31 n 93 496 53 176 163 Mean age N/A 11.45 10.9 10.35 10.1 Median age N/A 10 10 10 10 n N/A 390 48 168 128 Archaeological units/ 24M190M, 24M190M, 613 626, 627, 632, 634, Test Units 1, 2, 3 events 24M192M 24M192M 651, 652 Trinity Bay Context Crouse Phase 2 Crouse Phase 3b Crouse Phase 3c Crouse Phase 4 modern sample Description Food storage/ Workspace Fishing room/stage Workspace Jigged biological workspace sample Calendar age (A.D.) 1707–1765 1765–1805 1765–1820 Post-1805 1995 Century Early 18th Late 18th Late 18th Early 19th Late 20th Element Anterior abdominal Anterior abdominal Anterior abdominal Anterior abdominal Anterior abdominal Measurement Vertical diameter Vertical diameter Vertical diameter Vertical diameter Fork length Mean fork length 732.14 740.17 741.49 746.4 579 Median fork length 701.35 723.94 744.83 738.62 N/A n 34 25 155 57 1167 Mean age 10.38 10.25 9.51 10.84 5.09 Median age 10 10 10 10 N/A n 55 32 172 67 1167 Archaeological units/ 1203, 1288, 1318, 1011, 1019, 1031, 1411 1001, 1003,1 005, N/A events 1320, 1348 1045, 1085 1007, 1009, 1306 *(hm) 2014 Journal of the North Atlantic No. 24 M.W. Betts, S. Noël, E. Tourigny, M. Burns, P.E. Pope, and S.L. Cumbaa 4 (Ringer 2007:165). If this interpretation is correct, these remains would have been deposited around the ship by wave action and the behavior of scavenging fish in the decades surrounding its sinking. A radiocarbon assay on cod bone collagen derived from an aggregate sample from the shore-trench bone layer returned a date of 700 ± 50 BP. This date calibrates to a calendric range of 1549–1657 AD (1σ) using a standard marine dataset, which is consistent with the sinking of the San Juan in 1565 AD. Ferryland Harbour - Ferryland Mansion House, CgAf-02 Ferryland, located on the eastern Avalon Peninsula of Newfoundland, was occupied by migratory Breton fisherman as early as the 1550s (Pope and Batt 2008) and became a major center of fishing and trade during the following centuries. The two assemblages utilized in this study are derived from a 17th-century English structure known as the Mansion House, which was commissioned by Sir George Calvert, Secretary of State for King James I and, later, the first Lord Baltimore. Built between 1623–1625, it served as the Calvert family residence and later as the home of Newfoundland’s first governor and Ferryland’s economic and political elites until it collapsed during a French raid in 1696 (Gaulton and Tuck 2003, Tourigny 2009). The samples were recovered from various deposits associated with the house complex and are all representative of domestic activities that occurred in and around the house in the 17th century. All Ferryland contexts excavated in this report were screened through 6-mm mesh, which appears to be an adequate mesh size for recovering cod of the size ranges typically encountered in pre-industrial cod samples (e.g., Betts et al. 2011:177, Maschner et al. 2008). Because these samples are primarily from domestic contexts, obvious analytical issues must be addressed. Specifically, while all of the cod remains in these deposits were likely derived from the inshore fishery, they may nevertheless have been subjected to size selection due to daily consumption needs (i.e., selecting specific sizes of fish to suit the number of people being fed at specific meals). A preference for smaller cod than average would depress the mean size unnaturally, while a preference for larger cod would artificially inflate the mean. In the absence of other data points in the early 17th century, the Ferryland deposits are included in the present study, with caution, and with the understanding that their parameters must be carefully assessed in light of this potential bias, along with many other sources of variability (see below). The earlier Ferryland context relates to a midden that accumulated in and around a stable that abutted the Mansion House. This deposit is interpreted as a refuse midden associated with the house, accumulated sometime between 1625 and the dismantling of the stable ca. 1650. Element frequency analysis by Tourigny (2009:118, figure 7) suggests that this context (Event 613) contains a relatively even proportion of skeletal elements from all portions of the fish, indicating that fresh cod was predominately consumed during this period. Deposits representing the later occupation period at Ferryland include: 1) a midden that accumulated outside the southeastern portion of the Mansion House, interpreted as the result of trash accumulation from domestic activity on the second floor of the structure, 2) deposits associated with the interior of the principal living structure, and 3) deposits associated with the Mansion House’s cellar and the building which contained the cellar. The latter two contexts were associated with the collapse of the Mansion House, though artifactual remains largely indicate that they were deposited from the latter half of the 17th century up to the collapse of the structure in 1696. Importantly, this assemblage can be directly compared to the Bay Bulls assemblage (see below), which dates to essentially the same period. If the mean sizes and ages of fish from both sites are similar, it may indicate that the late Ferryland sample provides a relatively unbiased proxy for inshore cod population parameters during the late 17th century. The cod bone from this later Ferryland context tends to be dominated by caudal vertebrae and elements in the pectoral girdle (Tourigny 2009:118, figure 7), indicating that split and dried cod are largely represented by these remains (e.g., Barrett 1997). Bay Bulls - HMS Saphire, 18M The Saphire was a 32-gun British fifth-rate frigate which was scuttled by her captain, Thomas Cleasby, in Bay Bulls, Newfoundland, on 11 September 1696 after engaging a larger French force (Barber 1977, Proulx 1979). The ship was partially excavated in 1974 and 1975, a response to the looting efforts of commercial divers. The wreck lies 61 m from shore in ≈15 m of water and is preserved in relatively good condition, with much of the upper and lower decks preserved, but collapsed and covered in fine silt. Associated with the wreck was a thick layer of cod fish bones even more extensive than that described at Red Bay (Cumbaa 1981:14). Like the Red Bay excavations, the remains from Bay Bulls were excavated by hand with the aid of an air lift to remove floating sediment (Barber Journal of the North Atlantic 5 2014 No. 24 M.W. Betts, S. Noël, E. Tourigny, M. Burns, P.E. Pope, and S.L. Cumbaa 1977:311). Again, as at Red Bay, no screen was utilized and materials were bulk-lifted by hand as 100% samples, meaning that little size sorting of fragments could have occurred. There is a possibility that smaller elements could have been impacted by the airlift, although it was held approximately 30 cm above the excavated units and was only used to recover suspended sediment. Three 1-m x 1-m test units were excavated at the wreck, with the majority of material recovered from Test Unit 2. The majority of the cod bones were found in a layer approximately 10 cm thick underlying and compressed by the bottom of the Saphire’s hull; a small quantity of cod bones were also found amidst the timbers of the wreck (Cumbaa 1979). An analysis of the faunal remains shows an abundance of Atlantic cod (Cumbaa 1979, 1981). Salt cod stores would not be out of place on a British ship of the line of that era, though the Saphire had specific orders “… not to take on board the Ship … any sort of fish either by way of merchandize freight or otherwise, except what shall be for use and spending of your Ships company …” (Admiralty, Instructions to Thomas Cleasby, 1696). This documentary evidence indicates that we might expect an element distribution consistent with preserved fish brought on board to victual the ship, as was typical in the Royal Navy in the 17th century (Roberts et al. 2012:3). However, the Saphire assemblage indicates that abdominal vertebrae and head parts dominate the assemblage with concomitantly fewer caudal vertebrae and elements from the pelvic girdle (S.L. Cumbaa, unpubl. data). This element distribution is consistent with detritus from preparing dried fish (Barrett 1997), leaving two interpretative possibilities: 1) the remains are the result of processing fish within the ship, or 2) the remains are actually associated with fish processing on the shore and not with the use or sinking of the ship. The former option is difficult to accept given that fish processing would likely occur on the upper deck of the ship where detritus would simply be thrown overboard. More importantly, isotopes from the preserved remains of British Naval crews indicate that they ingested very little marine fish (e.g., Roberts et al. 2012). The latter option is therefore a more likely possibility, given that Bay Bulls was a major cod-fishing station in the 17th century. The Saphire was scuttled very close to shore and thus the remains may have settled amongst contemporary deposits from shore-based processing activities. The stratigraphy of the deposits appears consistent with this interpretation; the fish-bone layer and a clay deposit below it had been compressed by the Saphire’s hull; after the ship sank, cod bones continued to accumulate on the wreck, suggesting that the processes associated with the deposition of the cod bone layer were ongoing at the time of the sinking in 1696 (Cumbaa 1979). An almost identical situation occurred with cod remains found associated with the 24M (San Juan) wreck at Red Bay, which, as described above, were ultimately proven to be the result of contemporary shore-processing activities. Therefore, while the cod remains associated with the Saphire might represent deposits from an earlier period, using the Red Bay data as a taphonomic model suggests that a relatively close temporal relationship existed between the Saphire and the associated cod-bone layer (i.e., the decades surrounding 1696 AD). Crouse Harbour - EfAx-09 European fishing crews are documented at Cape Rouge Harbour, now Crouse, as early as 1541 (Pope 2008). Archaeological remains uncovered to date reflect intensive use by inshore fisherman from the middle 17th to the late 19th century (Noël 2010, Pope 2008). The archaeological site Dos de Cheval (EfAx-09) lies about 1 km northeast of the village of Crouse, on the north side of the Conche Peninsula and was the major fishing room known to Breton fishing crews as “Champ Paya”. The stratigraphy of the site is intricate and represents a complex palimpsest of repeated seasonal occupations over several centuries. Champ Paya was normally exploited by Breton and Norman crews but English or, more likely, Anglo-Newfoundland crews occupied the site briefly in the early 19th century (Pope 2008). Anything resembling domestic structures are ephemeral, but excavations did expose the stage where fish were landed, the galets used for drying fish, ramps and paths, a forge, a ramp for boat repair, and a bread oven, all generally related to the inshore cod fishery and the detritus it produced (Pope 2008, 2009). Due to extremely rocky soil, all deposits excavated from Crouse were screened through 10-mm mesh (Noël 2010:43). A test was conducted with bulk lifted (100% sample) soil to determine the degree of bias imposed by utilizing 10-mm mesh, resulting in the determination that primarily “small unidentifiable fragments of fish bone” were not recovered with this screen size (Noël 2010:43). This result suggests that, for present purposes, the size-based analysis should be relatively unbiased and that most of the cod remains from Crouse were large enough to not pass through 10-mm mesh. Four distinct archaeological contexts from Crouse were utilized in the present study (Table 1). 2014 Journal of the North Atlantic No. 24 M.W. Betts, S. Noël, E. Tourigny, M. Burns, P.E. Pope, and S.L. Cumbaa 6 All are relatively well dated based on chronological changes in associated historic artifact styles. The first is one of the older relatively undisturbed contexts from the Dos de Cheval site and dates ca. 1707–1765. Much of this deposit was the result of gear preparation, storage, and undifferentiated waste likely largely related to industrial fish processing. Several contexts associated with a captain’s table and social area (cook room) were removed from this analysis because of the unknown size-sorting effects of feasting and socializing. The second context dates to ca. 1765–1805 and includes a range of deposits associated with a boat ramp, working spaces, and undifferentiated waste. As with the first sample, contexts associated with a late 18th-century cook room were removed from this analysis because of the unknown size-sorting effects related to immediate consumption. The third deposit is directly associated with a fishing stage and its nearby spoil midden, which date from ca. 1750 to 1820, based on artifact styles. The final deposit dates to the post- 1805 period, with some indications that the bulk of the archaeological material is from the early 19th century prior to 1830. The assemblage includes a range of deposits associated with a working space as well as undifferentiated waste. Deposits of this time period thought to reflect on-site consumption were removed from the analysis. Noël (2010:76 –79, figure 17) conducted an extensive analysis of body-part representation for the Atlantic cod remains from Crouse. His analysis indicates that in every period and context utilized in this study, cod remains were almost entirely dominated by abdominal vertebrae and skull elements consistent with “… the model of dry cod, where the skull and vertebral column were left on the butchery site, and the appendicular elements included in the dry product” (Noël 2010:76). This finding indicates that the majority of cod remains from Crouse represent butchery, processing, and drying of the proceeds of the inshore cod fishery for export and trade (e.g., Barrett 1997). Methodological Considerations Size-based analyses of archaeological fish assemblages have increased in popularity in recent years, particularly in research concerned with conservation zooarchaeology (e.g., Betts et al. 2011; Jackson et al. 2001; Kenchington and Kenchington 1993; Maschner et al. 2008; Nagaoka 2005; Orchard 2001, 2003; Spiess and Lewis 2001). Methodological constraints are imposed on size-based analyses in many ichthyofaunal assemblages because natural and cultural taphonomic processes often restrict the types and abundance of differently sized skeletal elements that are preserved (Nagaoka 2005). In the present study, we focus our analysis on anterior abdominal (trunk, or thoracic) vertebrae because a) these are generally the most abundant element in the faunal assemblages, b) they can be roughly aged using growth-increment analysis, and c) they are the focus of other length and age studies in the region (e.g., Betts et al. 2011; Bourque et al. 2008; Jackson et al. 2001; Kenchington and Kenchington 1993; Rojo 1986, 1987, 1990, 2002; Spiess and Lewis 2001) and should therefore be directly comparable to those studies. Alfonso Rojo (1986, 1987, 1990, 2002) has created a series of regression formulae describing the allometric relationship between specific skeletal element measurements and the fork length and weight of Atlantic cod. In this study, we utilize the vertical diameter of the anterior abdominal vertebrae (measured from the cranial aspect) to estimate the live fork length of the cod from which the bone was derived. While Rojo (1987) has developed regression equations for several anatomical measurements on vertebrae, we use the vertical diameter measurement because it provides a stronger correlation than the horizontal diameter (Rojo 1987:215). Because the centrum of anterior abdominal vertebrae vary in size in a single individual and different researchers can differ in their identification of anterior versus pre-caudal vertebrae, we utilize Rojo’s average vertical diameter equation developed for all vertebrae classes (Rojo 1987:table 1). It should be noted that this formula provides the same correlation with fork length as results produced with the anterior abdominal vertical diameter regression formulae (in both cases r = 0.98), and therefore should produce precisely comparable length estimates. The equation (using measurements in mm) takes the following form: Fork Length = 119.25 + (56.46 x Vertical Diameter) The efficacy of utilizing vertebrae to document size structure in ichthyofaunal assemblages has not been studied in detail, but caution is warranted for anatomical reasons. Abdominal vertebrae are far more abundant in the fish skeleton than paired elements (e.g., Cannon 1987, Wheeler and Jones 1989). The relative frequency of vertebrae means that one very large or one very small fish, which may be better represented in the assemblage for myriad taphonomic reasons, could contribute a significant proportion of abdominal vertebrae to an assemblage, thus biasing the average length of the sample. To test for the presence of this type of bias in such assemblages, we compared fork-length estimates calculatJournal of the North Atlantic 7 2014 No. 24 M.W. Betts, S. Noël, E. Tourigny, M. Burns, P.E. Pope, and S.L. Cumbaa ed from the length of the ascending process of right premaxillae (Rojo 1986:345) to the vertical diameter of anterior abdominal vertebrae from the same Red Bay contexts (see Table 1). A two-way student’s ttest indicates that the mean fork lengths calculated from these two different measures are statistically equal (t = 0.1707, df = 587, P = 0.864487). This result strongly suggests that vertebrae measurements are directly comparable to those taken on paired elements and should not impose any undue bias as long as sample sizes are adequate. The efficacy of using vertebral growth increments to age fish is currently debated in the biological literature (Göçer and Ekingen 2005, Gunn et al. 2008, Khan and Khan 2009), with a general consensus that it results in assessments of age that are somewhat less accurate (but potentially still useful) than otoliths (Hill et al. 1989:841, Jones 1992:2, Prince et al. 1984; although see Khan and Khan 2009), typically because annual growth rings are more difficult to discern in vertebral centra than otoliths. The vertebral ring-counting technique remains popular in assessments of fish bone assemblages when otoliths are not abundant (Van Neer et al. 1999), particularly for Atlantic cod (e.g. Krivogorskaya et al. 2005, Rojo 1987, Spiess and Lewis 2001). As discussed by Wilson (1982:1375), there is often not a strict numerical agreement between vertebrae and more accurate growth-increment structures such as otoliths and scales, but there is often significant statistical agreement on a rank scale. That is, vertebrae are usually not precisely accurate absolute predictors of age, but can provide an indication of differences between populations on a rank-order level. Therefore, in the analysis that follows, we use our age estimates not to determine the absolute mean age of samples, but as a comparative device to assess the direction of changes between the mean age of fish vertebrae assemblages and to assess the potential magnitude of changes between the historical and modern eras. Similar to the observations of other researchers (e.g., Rojo 1987:221, Wilson 1982:1375), we observed that growth increments in cod vertebrae are sharp, dark, and highly visible close to the centrum but become more diffuse near the margins of the vertebrae, especially in larger fish. We viewed all of the samples analyzed here under a low-power binocular microscope, and the number of paired light (summer) and dark (winter) growth bands were counted and recorded as one year of the fish’s life. If a count ended in a partial light growth band, as the vast majority of vertebrae did, we noted this with a “+” notation but rounded down for quantitative purposes (essentially, the age counts utilized here reflect the number of dark growth bands). If the vertebrae ended in a partial dark growth band, we counted that as an additional year. The increment analysis for this study was conducted by four different analysts; however, despite identical training, we were concerned that interanalyst variability would be a problematic source of error. Therefore, we conducted a test by having three of the researchers analyze growth bands from a portion (n = 93) of the same assemblage from Crouse; encouragingly, a one-way ANOVA indicated there was no statistical difference between the mean ages (F2,276 =0.02, P = 0.982855) derived by the different researchers. Results Table 1 outlines the result of the fork-length and age analyses, and Figures 2 and 3 display box plots of the data for comparative purposes. As displayed by Figure 2 and Table 1, the mean fork length of the cod from these assemblages varies significantly over time, from a maximum of 806 mm to a low of 732 mm. An ANOVA returned a result of F8, 1243 = 5.14, P = 0.000003, indicating that there are significant differences in the mean fork length of cod in these samples. A Kruskal-Wallis one-way ANOVA of ranks returned a similar result for the median length (χ2 8df = 32.42904, P= 0.000078). The mean age of cod does not vary as significantly over the sequence, with a maximum mean age of 11.5 years and a minimum of 9.5 years. However, an ANOVA indicated that there are significant differences in mean age between the samples (F7, 1052 = 9.32, P < 0.0000001). Again, a Kruskal-Wallis one-way ANOVA of ranks returned a similar result for the median fork length (χ2 7df = 56.56892, P < 0.0000001). Modern data on age and length distributions for cod were obtained from a sample of 1167 handlined cod recovered from Smith Sound, in Trinity Bay, Newfoundland in 1995 (Brattey 1997). We conducted a series of ttests to compare the archaeological fork length and age means to the modern means, and all are significantly different (P < 0.01). A numerical comparison of these modern data to the archeological samples is very striking (Table 1); the average jigged cod taken in 1995 is at least 15 cm shorter than the smallest average of the previous 450 years and more than 22 cm shorter than the largest average cod from that period. While age comparisons may not be as accurate due to problems with aging vertebrae, the mean age of the modern cod was at least 4 years younger than the youngest archaeological sample. 2014 Journal of the North Atlantic No. 24 M.W. Betts, S. Noël, E. Tourigny, M. Burns, P.E. Pope, and S.L. Cumbaa 8 Figure 2. Box plots of mean fork length (in mm) as reconstructed from archaeological cod bone. The boxes represent the interquartile range, the line represents the median length, and the whiskers represent the largest and smallest estimated lengths. The circles represent the mean fork lengths for each sample. Figure 3. Box plots of the mean age (in years) as reconstructed from archaeological cod bone. The boxes represent the interquartile range, the line represents the median age, and the whiskers represent the largest and smallest ages. The circles represent the mean age for each sample. Journal of the North Atlantic 9 2014 No. 24 M.W. Betts, S. Noël, E. Tourigny, M. Burns, P.E. Pope, and S.L. Cumbaa factors, all part of the taphonomic history of the bone assemblages, which may have impacted the size distribution of the samples. In so doing, we attempt a comprehensive interpretation of the size and age variability inherent in Figures 2 and 3. Spatial variability in northern cod stocks Modern fisheries managers tend to treat Atlantic cod in the present study area as one large northern cod population, known as the “2J3KL” population (Fig. 1) based on North Atlantic Fisheries Organization (NAFO) convention areas (DFO 2012).1 Genetic differences can impact the growth and maturation rate of cod, thereby potentially impacting the size structure of the population. Genetic evidence has suggested that cod in the 2J3KL region are highly migratory and that there is considerable genetic homogeneity between cod stocks dispersed across local inshore bays and inshore/offshore populations (Beacham et al. 2002). However, some local heterogeneity has been discovered, with genetically distinct populations occurring within some bays and areas, presumably the result of a strong natal homing instinct in cod (Svedäng et al. 2007). DNA-based studies have indicated that the inshore cod stocks in both NAFO regions 3K and 3L are very similar genetically, and can be considered parts of a single population (Beacham et al. 2002:657, 659). These stocks are also closely related to the offshore stocks of the Northern Grand Banks and Funk Island Bank, though these show some distance-mediated genetic differences. This finding is to be expected because tagging studies reveal significant movement between bays and offshore banks for fish in the 3K and 3L regions (Brattey et al. 2000, Lilly et al. 2001). However, these studies indicate that inshore and offshore Labrador (2J) cod are very distinct genetically, suggesting they belong to separate cod populations (Beacham et al. 2002). While the genetic similarity of the stocks on the northeastern shore indicates that many of the sites we have sampled should be comparable, the genetic differences between the Labrador stocks calls into question variability in the size of the Red Bay sample, which is on average both much larger and older than any of the other samples. Modern populations of inshore cod in NAFO region 2J (Labrador) tend to be significantly smaller for their age (length and weight) than both inshore and offshore cod populations in 3L and 3K NAFO regions (Ruzzante et al. 2000: 436). This difference is probably a result of colder waters around Labrador, which negatively impact growth rates in Atlantic cod (Brander 1994, 1996). These data indicate that, all things being Of specific note are the maximum size and age values of the archaeofaunal cod recovered. Cod greater than 1 m in length commonly occurred in the assemblages, with one specimen, from Red Bay, returning an estimate of 175.1 cm. As a comparison, the largest cod recorded in the modern era from the Northeast Atlantic measured 160 cm (Moiseev 1953). Similarly, cod of 15 or more years regularly occurred in all but two of the assemblages. The oldest cod, from the Red Bay assemblage, was 30 years old and was associated with many additional individuals over 20 years of age. Modern cod typically have a life-span of approximately 15 years; the oldest cod caught in modern times, from coastal Labrador, was 27 years old (Lear 1984). Perhaps it is not unsurprising that the oldest and largest cod in the study were associated with the oldest sample in the sequence recovered from Red Bay. It is not unexpected that modern cod populations should be so significantly different from ancient cod populations. As discussed above, archaeological studies have documented significant differences in average size between such populations (Betts et al. 2011, Jackson et al. 2001, Kenchington and Kenchington 1993). However, what was not expected were the significant differences between the pre-modern samples themselves. Our statistical analysis clearly indicates significant changes in cod length over the 350-year period covered by our samples. Understanding Size and Age Differences in Archaeological Cod Assemblages The archaeofaunas discussed here represent samples of several different death assemblages, which themselves are drawn from potentially different living communities of fish (e.g., Lyman 1994:26–33). To understand variability in the samples, assessing their relationship to the living community and understanding the nature of the living community itself is of paramount importance. For example, if the different cod samples were removed from the same living community using the same fishing techniques and gear, and if their remains subsequently underwent similar taphonomic processes, then differences in length and age between the samples could reflect changes in cod stocks caused by climatic and/or exploitation pressures. However, because these samples are derived from four different archaeological sites excavated using four different methodologies, the samples may have very different taphonomic histories which could impact the size of the fish or the size of the fragments recovered. In the analysis that follows, we address multiple taphonomic, technological, behavioral, biological, and environmental 2014 Journal of the North Atlantic No. 24 M.W. Betts, S. Noël, E. Tourigny, M. Burns, P.E. Pope, and S.L. Cumbaa 10 and age over the sequence. It is possible that this assemblage reflects a more or less random sample of the inshore catch, although we can never be certain of this assumption. The element distribution from the late Ferryland cod assemblage, excavated from a domestic midden and cellar feature associated with the Mansion House, included an abundance of fin elements, caudal vertebrae, and elements in the pectoral girdle, which is consistent with a dried-fish assemblage (Tourigny 2009:118). If dried fish was procured in bulk (i.e., with little size selection) to provision the Mansion House, this assemblage may provide a relatively unbiased indicator of cod size and age of inshore cod for the period. Corroboration of this assumption may be provided by the roughly contemporaneous Bay Bulls sample, which is statistically indistinguishable from the late Ferryland assemblage (t = 0.5447, df = 337, P = 0.5864 for fork length; and t = 0.7252, df = 294, P = 0.4689 for age). This finding suggests the late Ferryland context is a good indicator of the captured-cod size structure. As outlined above, collections procedures between sites varied significantly. No significant size biases are likely to have been introduced in the recovery of the underwater assemblages from Red Bay and Bay Bulls as these remains were bulk-lifted as 100% samples of all specimen size classes. In contrast, the Ferryland deposits were screened with standard 6-mm mesh, suggesting that elements from the smallest size classes of cod may not have been completely recovered. This problem is even more severe at Crouse, where deposits were screened with 10-mm mesh due to limitations imposed by the rocky soil matrix. If coarse recovery methods did impact the average size of the vertebrae measured in this study, one would expect artificially inflated mean fork lengths (and ages) for each of these samples. This potential bias might be problematic if these samples returned larger means and ages than the Red Bay and Bay Bulls samples; however, this apparently did not occur, as Ferryland samples appear smaller than the bulk-collected samples from Red Bay, and the Crouse contexts tend to have the smallest mean lengths and ages of all the samples. Therefore, we believe that the cod comprising the death assemblages for these sites were generally so large that coarse recovery did not considerably impact their estimated size distribution (e.g., Betts et al. 2011:177). Regardless, the possibility exists that the Ferryland and Crouse estimates are artificially larger than the captured population (death assemblage) due to recovery issues. If this is the case, then the perceived declines in average size equal, the archaeological cod from Red Bay should be, on average, smaller than the samples from the 3L and 3K fisheries regions. However, the samples exhibit the largest mean size and greatest mean age when compared to other samples, a finding which is not consistent with a genetic difference in cod stocks being responsible for the archaeological patterns. In fact, modern genetic data suggest that if we had samples recovered from more southerly and warmer waters in northern and eastern Newfoundland dating to the middle 16th century, they would be even larger than the Red Bay cod. Archaeofaunal context/collections procedures As explained above, the samples used in this study were derived from diverse archaeological contexts collected in myriad fashions. However, before interpreting variability in the graph, it is critical that we assess whether differences in archaeological context or collections procedures might have caused the revealed patterning. As described above, the samples from Crouse, Red Bay, and Bay Bulls represent similar archaeological contexts which are all associated with debris from the commercial processing of salted and dried cod. While the proximity to flakes, other drying areas, and stages vary from context to context, the element distributions from these contexts indicate that all locations contain higher proportions of elements discarded during processing cod for salting and drying, including an overrepresentation of abdominal vertebrae and skull elements, excluding the pectoral girdle. As a result, the deposits should represent all size classes of fish that were processed for storage, thus providing a good proxy for shifts in the average size and age of the death assemblage. The Ferryland assemblages are perhaps the most problematic from the standpoint of archaeological context. As mentioned above, the earliest Mansion House context exhibits an element distribution consistent with the consumption of fresh whole fish. While this finding suggests the assemblage is derived from the inshore fishery, the data should be used with caution as the assemblage may have been subjected to post-capture selection factors related to immediate consumption (e.g., Cerón-Carrasco 1998, Barrett 1997, Bigelow 1984, Krivogorskaya et al. 2005). These factors could range from ease of preparing differently sized cod, to the estimated number of meal participants, to economic factors related to the purchase of the fish. Regardless, the mean fork length of this assemblage falls neatly within the range of variability of all samples, and fits nicely within a sequence of decreasing mean fork length Journal of the North Atlantic 11 2014 No. 24 M.W. Betts, S. Noël, E. Tourigny, M. Burns, P.E. Pope, and S.L. Cumbaa banned the use of seines in the 17th century, because they believed it removed smaller cod from the system (Lounsbury 1934). The notion that the French used seines in their early modern cod fishery would open up the possibility that the French assemblages from Crouse exhibit comparatively depressed average sizes and ages due to use of such seine technology. The Crouse samples do, in fact, have the lowest average means of the pre-modern assemblages, with the early 18th-century context exhibiting the smallest average length. A series of t-tests reveal that the slight increase in size over these four samples is not significant in this instance (P > 0.5). As we might expect, all of the Crouse samples, excepting the early 19thcentury context, also have the lowest average ages of the pre-modern sample. But, since there is no historical or archaeological evidence for the use of seines in fishing for adult cod in the period before 1800, we have to find another explanation for the continued decline in average cod size. On balance, our data as well as the documentary record give no indication that seines were used to take significant numbers of commercial cod in the period covered by the archaeological contexts, and thus differences in gear type are not responsible for the small average size of cod in the Crouse deposits. Furthermore, statistical tests reveal that the slight increase in the mean size and age of cod displayed by the Crouse samples is not significant. In fact, historical records exist that indicate that cod stocks continued to be impacted during the 18th century, the time period covered by the Crouse samples. For example, Turgeon (1995) has documented a decline in the ratio of cod liver oil to dried fish recorded in shipping records during the 18th century, indicative of a trend towards smaller average fish. This decline in mean size may correlate with the average declines in age we see in this period, which reach its lowest pre-modern levels in the late 18 th century (Fig. 3). Interestingly, the last pre-modern point in both datasets, dating to the early 19th century, occurs during a period when the French discontinued the use of seines for bait fish and banned longlines, the latter having been used on the banks fishery for many years, ostensibly to protect the inshore fishery (Hutchings and Myers 1995:70–71). In our samples, the early 19thcentury is marked by a slight increase in mean fork length and a significant increase in mean age. While tenuous, this finding indicates that the discontinuation of the seine for bait fish (including cod), and the delayed adoption of the longline, allowed for a brief recovery in the size and age of the northern cod stock in the early 19th century. This interpretation would suggest that the bait fishery was (and age) would be even larger than portrayed here, as the average size of fish from contexts with coarser recovery strategies would have been smaller than indicated in Figure 2. Gear type Fishing gear is size-selective and can result in differences in the average size of fish represented in harvested assemblages. Presumably, all of the assemblages analyzed here are the result of the inshore fishery, which from the late 15th century to the late 18th century was conducted by single fishermen using between one and three baited hooks on weighted lines (Pope 2004:25). The remarkable homogeneity of technology, gear type, and technique over hundreds of years is a unique trait of the handline fishery (e.g., Pope 2004:25), and had much to do with the need to catch fish in the size range preferred for drying and marketing the catch. Indeed, archaeological evidence documents that 18th-century cod hooks from the French settlement of Louisburg, 17th-century cod hooks from the English town of Ferryland, and 16thcentury cod hooks from the Basque fishing station of Red Bay are virtually identical in size-range and shape (e.g., Charlotte 2004:126, Nixon 1999:176; see also Duhamel du Monceau 1772: plates 1–7 for a description of French handline gear in the 18th century). All are eyeless wrought-iron hooks approximately 6.5–11.0 cm long, with a “gap” approximately 2.0 to 3.5 cm, a size range remarkably similar to “J” hooks used in modern handlines and longlines (Betts et al. 2011:176). Based on the archaeological and historical evidence, differences in gear type for the handline inshore fishery over the last half millennium that may have impacted the size of average fish caught appear largely negligible and therefore should not be responsible for any patterns in the archaeological data presented here. Some sources suggest that the French employed seines to take cod throughout much of the 16th, 17th, and 18th centuries (de Loture 1949, Hutchings and Myers 1995:86). However, there is no apparent corroborating evidence that the French used seines to capture anything but bait fish during this period. The contemporary observers of the fishery, Denys (1672) and Duhamel du Monceau (1769), both describe a strictly line-based cod fishery on the coasts of Acadia and Newfoundland, while the foremost authority on the history of the French fishery in Atlantic Canada, de la Morandière (1966), indicates that prior to AD 1800 seines were used only to take bait fish (cf. Candow 2009a:392–398). Bait fish were normally caplin or herring but also included small cod. The English 2014 Journal of the North Atlantic No. 24 M.W. Betts, S. Noël, E. Tourigny, M. Burns, P.E. Pope, and S.L. Cumbaa 12 as the climate change lasted for a sustained period (e.g., several years), and as long as both the chronological resolution of the archaeological samples and the climatic records are such that short-term or longterm climatic trends can be traced. Regardless, understanding the local effect of this sort of temperature-mediated recruitment is difficult, because, essentially, the response of cod populations to climate change is highly dependent on where local sea temperatures fall within their preferred temperature range. For example, studies of northern cod around Newfoundland indicate that ocean warming (SST increases from 1 to 4 degrees above present) will likely increase cod populations in most Newfoundland waters (Drinkwater 2005:1331, 1333). Conversely, research has shown that cold periods result in a reduction of cod populations in inshore Newfoundland waters (Pörtner et al 2001:1977). In the Gulf of Maine, at the southerly range of the cod’s distribution and where water temperature averages are much higher, the opposite is likely to occur. There, higher sea surface temperatures will negatively affect cod recruitment, and lower temperatures will result in positive effects (e.g., Drinkwater 2005:1331, Fogarty et al. 2008:464–465, Planque and Frédou 1999, Sunby 2000:283–284, Pörtner et al. 2008:1977; see also Betts et al. 201 1). Cod around Newfoundland and southern Labrador live at the lower temperature range for the species (Sunby 2000:283), and correlations have previously been noted between higher cod densities and increases in temperature, such as that which occurred during the AD 1920–1940 warming event off Greenland (Rose 2005:1369). Changes in sea-surface temperature can also result in distributional or migrational changes in cod species (Drinkwater 2005:1333, Rose 2005:1361, Sunby 2000:280). Newfoundland and Labrador populations are known to move to more appropriate locations (both locally and regionally) in response to climate change (Rose 2004). Therefore, in general, cold regimes should negatively affect recruitment in Newfoundland and Labrador waters; this reduction in juveniles would necessarily be evidenced by an overall increase in mean fork length. Conversely, in warm sea-temperature regimes, recruitment of juveniles will increase around Newfoundland, resulting in a general decrease in mean fork length. It should be noted that in a previous paper (Betts et al. 2011) we have argued that Atlantic cod populations should positively respond to cold regimes in the Gulf of Maine, which is located at the southerly limit of Atlantic cod’s range. This data is supported by recent research (Drinkwater 2005:1333) which indicates that increasing SST at least in part regulating the average size of cod in the Crouse samples (i.e., fewer small fish were being procured), and thus it was impacting cod stocks in a measurable way. Unfortunately for this study, many of the major changes in gear type occur during a period for which we have no archaeological data. After ca. 1850, longlines were introduced to the inshore fishery, followed by cod traps in the 1870s (Hutchings and Myers 1995:70). In the 20th century, gradual increases in the use of boat motors and motorized hauling mechanisms (for setting and hauling longlines and traps) greatly increased the efficiency of these gear types. It is generally understood that compared to jigs, longline trawls tend to select for smaller fish (Halliday 2002) and cod traps tend to select for larger, more mature fish (Maschner at al. 2008:392). If we had archaeological data for the late 19th century, the competing effects of these two different gear types could potentially obfuscate patterning in the sizes of recovered fish bones. Climate change Climate change, especially changes in storminess and sea surface temperature (SST), are known to have significant impacts on demersal fish popula - tions such as cod (Drinkwater 2005, Pörtner et al. 2001, Sunby 2000). In some areas of the northern world, cold climate regimes appear to positively impact fish populations. However, the relationship between Atlantic cod and temperature is very complex, and spatially different cod populations can react differently to sea temperature changes (Pörtner et al 2001:1977). Atlantic cod prefer to feed where sea bottom temperatures are in the -1 o to 10 oC range and to spawn in waters typically in the -0.5 o to 6 oC range (Rose 2005:1363). In general, when sea surface temperatures increase, cod recruitment tends to increase where sea bottom temperatures are cooler than 5 oC. In contrast, recruitment decreases when bottom temperatures are above 8.5 oC (Drinkwater 2005:1331, Sunby 2000:278). The relationship between recruitment inputs and average length is well established in fisheries research (e.g., Shin et al. 2005:table 1), such that smaller average sizes are generally associated with higher recruitment levels because of the regular input of smaller juvenile fish into the population. Conversely, large average sizes should be associated with decreased numbers of juveniles. Given that juvenile inputs into the cod population system occur on a yearly basis, we believe that changes in length caused by changes in recruitment should be preserved in archaeological cod bone samples, as long Journal of the North Atlantic 13 2014 No. 24 M.W. Betts, S. Noël, E. Tourigny, M. Burns, P.E. Pope, and S.L. Cumbaa values will, in general, negatively impact Gulf of Maine Atlantic cod stocks, resulting in population declines and decreased recruitment, while colder regimes should result in an increase in recruitment (see Betts at al. 2011 for application to a cod-length sequence from the Gulf of Maine). Understanding these competing climatic variables in an archaeological context is very difficult because climate records are often too coarse to apply directly to the archaeological record. However, recent high-resolution analysis of δ15N and δ40Ar gas in the GISP2 ice core has resulted in an annual record of average air temperature for the Eastern Arctic/Greenland which can be used as a proxy for the North Atlantic. The nitrogen-argon method is specifically suited to measuring abrupt climate changes and tends to result in a higher amplitude record than comparable δ18O temperature reconstructions (Kobashi et al. 2011:2). These data have been plotted in Figure 4 (utilizing publicly released data after Kobashi et al. 2011) simultaneously with the GISP2 δ18O values for comparative purposes (utilizing publically released data after Alley 2000). The GISP2 data reveal that a warming period, the Medieval Climatic Anomaly, occurred during the 11th and 12th centuries AD, and was followed by a slow decline in temperatures after ca. 1400 AD, the beginning of the Little Ice Age (Kobashi et al. 2011). Figure 4 shows that this cooling trend persisted, punctuated by decades of warmer temperatures, until ca. 1600 AD, after which the region experienced a maximum period of cooling, reaching its coldest temperatures in the 18th century. Temperatures slowly recovered until about 1850, marking the end of the Little Ice Age, after which temperatures rapidly increased to present levels (see also Kobashi et al. 2011). If shifts in average sea temperatures did impact mean lengths and ages of the Northern cod stocks throughout its range, one would expect that the slow decline in temperature from 1500 to 1700 would be associated with an increase in mean length around Newfoundland as recruitment decreased and the proportion of juveniles declined. However, this pattern is the exact opposite of the trends observed in our samples, which indicate that both mean length and age decrease progressively over this cold period. Nevertheless, it is important to point out that reconstructions of historic catch rates based on archival documents (Pope 1997, 2004:table 1, 2006; Figure 4. δ15N and δ40Ar temperature reconstruction from the GISP2 ice core (Kobashi et al. 2011; data from ftp://ftp.ncdc. noaa.gov/pub/data/paleo/icecore/greenland/summit/gisp2/isotopes/gisp2-temperature2011.xls), plotted simultaneously with δ18O temperature reconstruction from the GISP2 core (Alley 2000; data from ftp://ftp.ncdc.noaa.gov/pub/data/paleo/ icecore/greenland/summit/gisp2/isotopes/gisp2_temp_accum_alley2000.txt). 2014 Journal of the North Atlantic No. 24 M.W. Betts, S. Noël, E. Tourigny, M. Burns, P.E. Pope, and S.L. Cumbaa 14 Starkey and Haines 2001:table 2) for the 17th–19th centuries correspond well with the reconstructed temperature changes recorded in Figure 4. Furthermore, reports of reduced inshore catches between 1710 and 1739, which were so severe that they played a significant role in the entry of the British into the offshore cod fishery (Hutchings and Myers 1995:72, Lounsbury 1934, Starkey and Haines 2001:6), correlate with the coldest temperatures of the study period. It is also interesting to note that the lowest average mean cod fork lengths around Newfoundland occur during this extremely cold period, which is the opposite of what we might expect if climate change were mediating these effects (as described previously, cold regimes should be indicated by an average increase in length as cod recruitment decreased). However, one potential instance of correlation may be identified in the slight increase in the mean age of cod during the coldest period of the Little Ice Age, during the early 18th century. If cold negatively affected recruitment in the Newfoundland stock, an increase in mean age would result. As indicated in Figure 4, average temperatures continued to climb during early 19th century, which should be associated with a decrease in mean age and length in our samples as juvenile recruitment increased; however, the mean length increased slightly while the mean age increased dramatically. Thus, while the correlation between the historical catch rate data varies as would be expected with temperature, this correlation does not hold for the archaeological data. This implies that although these climate shifts mediated the distribution of cod significantly (after Rose 2004), they in general did not impact the fork length and age structure of cod in a manner that could be tracked here. In sum, climate proxies appear to have little relationship to the metric parameters of our samples and thus the parameters of the historically fished cod populations of Newfoundland and Labrador. A slight increase in mean age during the coldest period of the Little Ice Age, in the early 1700s, may be the only climatically linked change that can be tracked by our metric data. This finding strongly suggests that variability in cod population structure, as measurable from archaeofaunas, was primarily mediated by factors other than climatic and environmental conditions. Human exploitation pressure The earliest written record of a European (English) inshore cod fishery in Newfoundland and Labrador is from 1502 (Quinn 1979:110). Historic documents indicate that the fishery expanded throughout the early 16th century with Portuguese plying Newfoundland waters by 1506, followed by Basque ca. 1520 (Pope 2008). While Basque and Portuguese participation had waned by the late 16th century, the English fishery steadily increased, with the number of participating ships increasing rapidly between 1550 and 1600 (Cell 1982, Musset 1899). The French and English shore-based fisheries expanded and became entrenched in the early 1600s. By the middle-late 17th century, continued wars with the Spanish and Dutch reduced the size of the English fishing fleet dramatically, reaching a low in the 1660s (Matthews 1968) after which it recovered and expanded rapidly (Pope 2004:19–20). At the same time, the French fishery expanded steadily throughout much of the 17th century until the 1680s when it too declined (Pope 2004:424–425). The 17th-century French migratory transatlantic fisheries often produced over 50,000 tons of cod in a season, dwarfing the contemporary British fisheries, which produced about 20,000 at best (Candow 2009a:409). Note that these figures do not represent the weight of live catch, which would have been almost five times these figures. At least half of this fish was produced in Newfoundland (Pope 1997:table 4). War between Great Britain and France at the turn of the 18th century had considerable negative impact on the fisheries of both nations, and warfare continued to affect the transatlantic fisheries into the early 19th century (Candow 2009a:424). The wide geographic dispersion of the French fishers permitted them to adjust their participation in particular areas, for example, by increasing effort in the postwar decades after 1713 at Cape Breton and reducing effort on Newfoundland’s Petit Nord where catches were currently poor. In the early 18th century, France produced at best between 25,000 and 40,000 tonnes of transatlantic cod (Candow 2009a:426–427), while English production expanded significantly from their 17th-century baseline to as much as 38,000 tonnes at Newfoundland alone (Lounsbury 1934). English participation in both the migratory and resident fishery at Newfoundland increased steadily through the second half of the 18th century. For example, a steady increase in documented catch rates in Trinity Bay can be observed between 1710 and 1830 (Myers 2001:21). After the Seven Years’ War (1756–1763), French production rebounded and then fluctuated wildly but more or less stabilized at almost 40,000 tonnes—still impressive, given that the Treaty of Paris in 1763 now confined French fishing crews to Newfoundland waters (Candow 2009a:432). In the late 18th century, the British migratory fishery began a decline which became definitive after 1815, with the rapid growth of a Newfoundland Journal of the North Atlantic 15 2014 No. 24 M.W. Betts, S. Noël, E. Tourigny, M. Burns, P.E. Pope, and S.L. Cumbaa resident fishery (Candow 2009b:436–439, Ryan 1986). France suspended fishing at Newfoundland (with minor exceptions) during the Napoleonic Wars (1793–1815) but re-established its transatlantic industry after the wars, expanding fishing on the French Shore rapidly in the 1820s (Candow 2009b:439). The re-establishment of the treaty shore pushed the growing Newfoundland-based floater fishery to Labrador, which saw rapid growth through the 19th century, accounting for 46% of the entire Newfoundland and Labrador catch by 1890 (Ryan 1986). The inshore resident fishery on the Northern Peninsula and the west coast expanded greatly after France ceded its treaty rights to a shore fishery in 1904, so that the number of resident Newfoundland fishermen doubled between 1857 and 1911 (Hutchings and Myers 1995:57). The inshore fishery exceeded the offshore banks fishery consistently during the first half of the 20th century. Overall catches continued to increase, even though inshore fishing catch rates per fisherman declined significantly after ca. 1910 (Hutchings and Myers 1995:52–53, 57). Regardless, fishing effort continued to increase and catches continued to expand, reaching an historic maximum in 1968. Historical records indicate that the inshore fishery went through many “boom and bust” cycles over the last half millennium, at least some of which were believed (at the time) to be a result of overfishing. Hutchings and Myers (1995) have quantified harvest rates (proportion of estimated harvestable biomass actually caught) from 1500 to 1995 based on historical documents. Their estimates indicate a slow increase in harvest rates to ca. 1700, after which harvesting rates increased significantly, to a peak in ca. 1920, with significant declines in harvest rates at ca. 1710–1730, 1800, 1830–1850, 1875, and 1900 (see also Cadigan and Hutchings 2001:36). Data clearly show that catch rates on the English shore were depressed during much of the mid-17th century, from ca. 1657–1675, after which they recovered slightly before collapsing again at the turn of the 18th century (Pope 1997, 2004, 2006). Detailed research by Starkey and Haines (2001), reveals that these changes must be kept in relative terms because catch rates were generally quite high (more than 200 quintals per boat) for nearly every year between 1676 and 1828, except for the period between 1710 and 1730. This data indicates a fishery that was ultimately still very productive right up until the middle 19th century (e.g., Hutchings and Myers 1995:81, Starkey and Haines 2001:9). This extended productivity does not mean that exploitation pressure wasn’t significant and, in the absence of clear gear changes or climatic impacts, the statistically significant decline in the average size and age of cod from the mid-16th century to the early 18th century can only be interpreted as the result of fishing pressure. While changes in the latter part of the graphs may be somewhat obscured by climate change and the effect of gear types that impacted the size of fish caught by jigs, the decline in mean age from the early 18th century to its lowest pre-modern point in the late 18th century persuasively suggests that changes in this era were also mediated by fishing pressure. Again, it is important to note here that the decline in age is consistent with research that documents an average decline in cod size over the 18th century based on the ratio of cod liver oil to salt cod produced (Turgeon 1995). If the early historic fishery was impacting cod populations significantly (by removing larger, older fish from the system faster than they could be replaced), did its participants recognize the effect of their overfishing? A host of conservation measures were instituted between the 17th and 19th centuries, indicating that inshore fishers were concerned about the impact their fishing was having on stocks (cf. Pope 2004:424). In 1663, the English banned the catch of small bait cod using seines to protect the cod fishery (Hutchings and Myers 1995:71, Lounsbury 1934). Although they persisted in using this technology in the Petit Nord, the French nevertheless outlawed the adoption of longlines by the inshore fishery in the late 18th and early 19th centuries (Hutchings and Myers 1995:71). This opposition to longlines continued throughout the mid- to late 19th century, apparently because fishermen perceived that this gear type unnecessarily removed very large spawning cod from the population. Declining catches in the late 19th century were troublesome enough that the Newfoundland government commissioned a report to study the causes of the decline in 1877 (Hind 1877), instituted a governing body, the Newfoundland Fisheries Commission in 1889, and built a cod hatchery in Trinity Bay in 1890. All of these efforts appear to be related to a commonly held perception that overfishing was the cause of the declines (Harvey 1894, 1900). Did these conservation efforts work? The slight increase in cod size and age in the early 19th centuries may be a response to the reduction in the use of seines to take bait cod, but otherwise it is difficult to track any other effects of conservation efforts on the mean age or size of archaeological cod. It is also possible that the prolonged period of warfare that affected the fisheries during the late 18th and early 19th centuries played a role in the seeming recovery in average age and length at that time. 2014 Journal of the North Atlantic No. 24 M.W. Betts, S. Noël, E. Tourigny, M. Burns, P.E. Pope, and S.L. Cumbaa 16 Nevertheless, the available historical records indicate that over the ≈350 years tracked by these data, fishing effort was increased at every opportunity, punctuated only occasionally by reductions in the fleets due to war and/or small conservation measures. Indeed, the overall trend indicated by our zooarchaeological analysis is towards decreasing mean size and decreasing mean age, a finding which can only be explained by the increase in fishing effort over this period. Fishing pressure is known to impact the size and age structure of fished populations over time (Andersen et al. 2007, Swain et al. 2007), and the available data indicate that Newfoundland cod stocks were significantly affected very early in the European fishery, within the first 50 to 100 years that we can track with archaeological data. This analysis does not, however, mean that the early fishery was not sustainable, only that it had an inevitable impact on cod populations. As suggested by Hutchings and Myers (1995:56), “If only 25% of the estimated harvestable biomass was available to inshore gear each year, fishing mortality rates may have exceeded sustainable levels … [only by] the early 19 th century”. Conclusions This multidisciplinary study has brought together data from history, archaeology, zooarchaeology, biology, and fisheries research in an attempt to quantitatively assess changes in cod populations in Newfoundland and Labrador inshore waters. Utilizing size and age as our primary metrics, our paper focuses on two primary issues: 1) sample quality and relevance, and 2) a holistic analysis of various factors impacting the size and age distribution of cod bone assemblages. While the sample-quality issues outlined in this paper are comparable to many other studies with similar goals, aspects relating to sample size and differential recovery methods remain problematic. Regarding sample size, it is important to note that all of the faunal assemblages analyzed in this report where derived from extensive excavations resulting in samples that each contained hundreds, and often thousands, of identifiable cod bones. However, although the assemblages were large and well preserved, fragmentation was a serious issue. Even relatively minor damage to the vertebral body (in all cases the most abundant elements in each assemblage) negated that element from measurement, therefore severely limiting sample sizes. Some of the fragmentation we witnessed was a result of trephic factors (those taphonomic factors affecting the assemblage after collection), and we recommend that where age and size studies are a goal of analysis, special care be taken to carefully protect fragile fish remains. Collection and sieving protocols are pernicious issues in icthyofaunal research. The samples in this study result from myriad collections procedures, ranging from 100% (bulk) recovery to relatively coarse collection with 10-mm mesh screen. Despite these differences, our analyses suggest that those samples with the smallest mean size were the samples collected with the coarsest recovery methods. In fact, it is likely that if the cod from Crouse would be even smaller, on average, had bulk recovery or finer recovery procedures been utilized. While these fortunate coincidences are specific to our particular study, we believe our analysis demonstrates that it is possible to work with collections collected using differential recovery methods, as long as careful consideration is given to the possible effect of those recovery techniques on the variables being measured and on the inferences drawn from them. We believe that it is necessary to adopt a careful holistic approach in all sized-based zooarchaeological studies. Average measures are by nature difficult to interpret, and therefore carefully considering multiple competing influences, including taphonomic and sampling issues, are necessary to fully understand patterning. In this instance, climatic variables were probably the most difficult variable to assess given that cod stocks respond in complex ways to temperature changes. Another issue arises from the fact that detailed palaeoenvironmental data from Newfoundland and Labrador does not exist on the decadal scales necessary to compare to the resolution of our samples, forcing the use of proxy data from Greenland. On balance, however, the available climatic data do not suggest that temperature changes had a significant impact on the size and age distribution of the cod in our samples. Rather, it seems clear that the primary reason for most changes in size was exploitation pressure. From this perspective, the most telling result of our analysis is that cod recovered from all archaeological sites were on average much larger than anything caught with the same methods today. 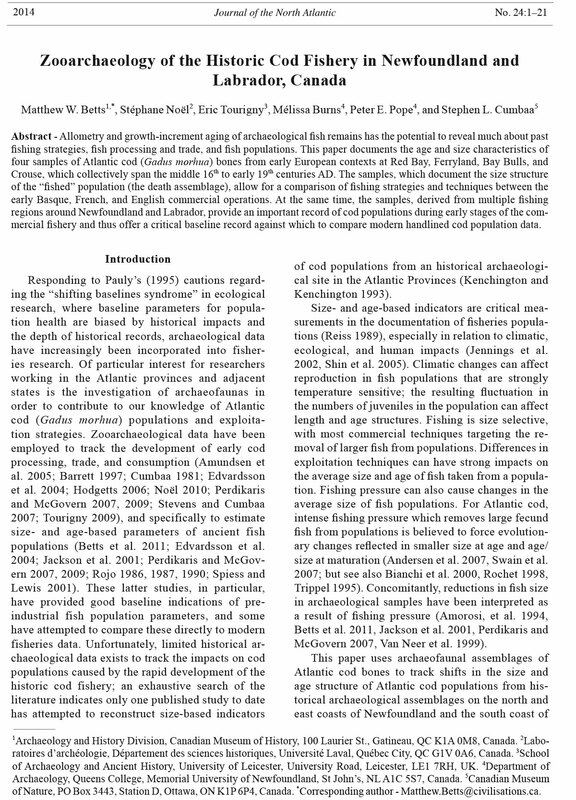 As documented by Starkey and Haines (2001:9), the Newfoundland cod “… fishery was prone to fluctuate”, but there is little remaining debate that the most significant damage to northern cod stocks in recent years was caused by massive increases in fishing effort between 1950 and 1990, a nightmarish model for recruitment overfishing (Rose 2004, Sinclair and Murawski 1997). However, the archaeofaunal data presented here provide some indication that cod stocks were being significantly impacted much earlier, perhaps by the Journal of the North Atlantic 17 2014 No. 24 M.W. Betts, S. Noël, E. Tourigny, M. Burns, P.E. Pope, and S.L. Cumbaa 17th century (cf. Pope 2006). That the historic fishery had a measurable negative impact on stocks so quickly should not be unexpected considering that fishing pressure on cod increased from a subsistence-level aboriginal fishery to one of the world’s largest commercial fishing operations in the course of a few generations. Rather, what is noteworthy is that significant fishing returns were able to be sustained for so long (e.g., Starkey and Haines 2001). Our data indicate that northern cod stocks experienced only a gradual change in the mean fork length and age over 350 years of unprecedented fishing pressure. Indeed, the very precipitous declines in the average size and age of cod occurred in the period between 1850 and 1990, which unfortunately is not covered by archaeological data. That the northern cod stock bore this onslaught for so long is a testament to just how productive the waters of Newfoundland and Labrador were, and how resilient the species was to human exploitation. Acknowledgments The research described above was kindly supported by the Canadian Museum of History, the Canadian Museum of Nature, the Memorial University of Newfoundland, the Social Sciences and Humanities Research Council of Canada, the Provincial Archaeology Office (PAO) of Newfoundland, the Institute for Social and Economic Research, and the J.R. Smallwood Foundation. Parks Canada provided access to the Bay Bulls and Red Bay collections in the form of a long-term loan of materials. Colin Amudsen graciously provided advice stemming from his previous work on these two assemblages. Carolyn Tropea measured thousands of cod vertebrae for this study, and her patience and dedication are greatly appreciated. Karen Ryan and David Morrison commented on a previous version of this manuscript, and their advice is greatly appreciated. We thank Sophia Perdikaris and Keith Goldfarb for shepherding this paper through the editorial process, and we appreciate the insightful comments of the two anonymous reviewers; their comments and advice resulted in a far better offering. Literature Cited Admiralty, Instructions to Thomas Cleasby. 1696. ADM 2/20:210–212, The National Archives, London, UK. Alley, R.B. 2000. The younger dryas cold interval as viewed from central Greenland. Quaternary Science Reviews 19:213–226. Amorosi, T., T.H. McGovern, and S. Perdikaris. S. 1994. Bioarchaeology and cod fisheries: A new source of evidence. ICES Marine Science Symposia 198:31–48. Amundsen, C., S. Perdikaris, T.H. McGovern, Y. Krivogorskaya, M. Brown, K. Smiarowski, S. Storm, S. Modugno, M. Frik, and M. Koczela 2005. Fishing booths and fishing strategies in medieval Iceland: An Archaeofauna from the Akurvík, north-west Iceland. Environmental Archaeology 10(2):127–142. Andersen, K.H., K.D. Farnsworth, U.H. Thygesen, and J.E. Beyer. 2007. The evolutionary pressure from fishing on size at maturation of Baltic cod. Ecological Modeling 204(1–2):246–252. Barber, V.C. 1977. The Saphire, a British frigate, sunk in action in Bay Bulls, Newfoundland, in 1696. The International Journal of Nautical Archaeology and Underwater Exploration 6(4):305–313. Barrett, J.H. 1997. Fish trade in Norse Orkney and Caithness: A Zooarchaeological approach. Antiquity 71:616–638. Beacham, T.D., J. Brattey, K.M. Miller, K.D. Le, and R.E Withler. 2002. Multiple stock structure of Atlantic Cod (Gadus morhua) off Newfoundland and Labrador determined from genetic variation. ICES Journal of Marine Science 59:650–665. Bernier, M-A., and R. Grenier. 2007. Dating and identification of the Red Bay Wrecks. Pp. 291–308, In R. Grenier, M-A. Bernier, and W. Stevens (Eds.). The Underwater Archaeology of Red Bay: Basque Shipbuilding and Whaling in the 16th Century, Volume 4. Parks Canada, Ottawa, ON, Canada. Betts, M., H.D.G. Maschner, and D. Clark. 2011. Zooarchaeology of the “fish that stops”: Using archaeofaunas to construct long-term time series of Atlantic and Pacific cod populations. Pp. 171–195, In M. Moss and A. Cannon (Eds.). The Archaeology of North Pacific Fisheries. University of Alaska Press, Anchorage, Alaska, USA. Bianchi, G., H. Gislason, K. Graham, L. Hill, X. Jin, K. Koranteng, S. Manickchand-Heileman, I. Paya, K. Sainsbury, F. Sanchez, and K. Zwanenburg. 2000. Impact of fishing on size, composition, and diversity of demersal fish communities. ICES Journal of Marine Science 57:558–571. Bigelow, G.F. 1984. Subsistence in late Norse Shetland: An Investigation into a northern island economy of the Middle Ages. Unpublished Ph.D. Dissertation. University of Cambridge, Cambridge, UK. Bourque, B.J., B. Johnson, and R. Steneck. 2008. Possible prehistoric fishing effects on coastal marine food webs in the Gulf of Maine. Pp. 165–185, In T.C. Rick and J.M. Erlandson (Eds.). Human Impacts on Ancient Marine Ecosystems: A Global Perspective. University of California Press, Berkeley, CA, USA. Brander, K.M. 1994. Patterns of distribution, spawning, and growth in North Atlantic cod: The utility of interregional comparisons. ICES Marine Science Symposia 198:406–413. Brander, K.M. 1996. Effects of climate change on cod (Gadus morhua) stocks. Pp. 255–278, In C.M. Wood and D.G. McDonald (Eds). Global Warming: Implications for Freshwater and Marine Fish. Cambridge University Press, Cambridge, UK. Brattey, J. 1997. Biological characteristics of Atlantic cod (Gadus morhua) from three inshore areas of northeastern Newfoundland. NAFO Science Council Studies 29:31–42. Brattey, J., N.G. Cadigan, G.R. Lilly, E.F. Murphy, P.A. Shelton, and D.E. Stansbury. 2000. An assessment of the cod stock in NAFO subdivision 3Ps in October 2000. Canadian Stock Assessment Secretariat Research Document, 2000/134. Ottawa, ON, Canada. 2014 Journal of the North Atlantic No. 24 M.W. Betts, S. Noël, E. Tourigny, M. Burns, P.E. Pope, and S.L. Cumbaa 18 Cadigan, S.T., and J.A. Hutchings. 2001. Nineteenthcentury expansion of the Newfoundland fishery for Atlantic cod: An Exploration of underlying causes. Pp. 31–66, In P. Holm, T. Smith, and D. Starkey (Eds.). The Exploited Seas: New Directions for Marine Environmental History. Research in Maritime History 21, Memorial University of Newfoundland, St. John’s, NL, Canada. Candow, J.E. 2009a. The organisation and conduct of European and domestic fisheries in Northeast North America, 1502–1854. Pp. 387–415, In D. Starkey, J.T. Thór, and I.A. Heidbrink, (Eds.). History of the North Atlantic Fisheries. Volume 1: From Early Times to the Mid-Nineteenth Century. Deutsche Maritime Studien, Verlag H.M. Hauschild, Bremerhaven, Germany. Candow, J.E. 2009b. Migrants and residents: The Interplay between European and domestic fisheries in Northeast North America, 1502–1854. Pp. 416–444, In D. Starkey, J.T. Thór, and I.A. Heidbrink, (Eds.). History of the North Atlantic Fisheries. Volume 1: From Early Times to the Mid-Nineteenth Century. Deutsche Maritime Studien, Verlag H.M. Hauschild, Bremerhaven, Germany. Cannon, D.Y. 1987. Marine fish osteology: A Manual for archaeologists. Department of Archaeology. Publication No. 18. Simon Fraser University, Burnaby, BC, Canada. Cell, G.T. 1982. Newfoundland Discovered: English Attempts at Colonization, 1620–1630. The Hakluyt Society, London, UK. Cerón-Carrasco, R. 1998. Fishing: Evidence for seasonality and processing of fish for preservation in the northern island of Scotland during the Iron Age and Norse times. Environmental Archaeology 3:73–81. Charlotte, G. 2004. The Museum Called Canada: 25 Rooms of Wonder. Random House, Toronto, ON, Canada. Cumbaa, S.L. 1979. An analysis of animal bones from the 1696 wreck of HMS Saphire, Bay Bulls, Newfoundland. Manuscript on file, Zooarchaeological Identification Centre, Museum of Nature, Ottawa, ON, Canada. Cumbaa, S.L. 1981. Preliminary analysis of bones from a 16th-century Spanish Basque shipwreck and whaling station in Red Bay, Labrador. Pp. 21–26, In G.P. Watts, Jr. (Ed). Underwater Archaeology: The Challenge Before Us (Proceedings of the 12th Conference on Underwater Archaeology). Fathom Eight Special Publication No. 2, San Marino. de Loture, R. 1949 Histoire de la Grande Pêche de Terre- Neuve. Gallimard.Loture, Paris, France. de la Morandière, C. 1966. Histoire de la Pêche Française de la Morue dans l'Amérique Septentrionale (de la Révolution à Nos Jours), Tome iii, Dictionnaire Terreveuvier. Maisonneuve et Larose, Paris, France. Denys, N. 1672 Histoire Naturelle des Peuples, des Animaux, des Arbres et Plates de l'Amerique Septentrionale and de Ses Divers Climats Vol. 2. Reprinted in The Description and Natural History of the Coasts of North America (Acadia) by Nicholas Denys, edited by W.F. Ganong. 1868 Reprint of the 1908 Edition. Champlain Society, Greenwood Press, New York, NY, USA. Drinkwater, K.F. 2005. The response of Atlantic cod (Gadus morhua) to future climate change. ICES Journal of Marine Science 62:1327–1337. Duhamel du Monceau, H-L. 1772. Traité Général des Pesches. Chez Saillant and Nyon, Paris, France. Edvardsson, R., S. Perdikaris, T.H. Mcgovern, N. Zagor, and M. Waxman. 2004. Coping with hard times in NW Iceland: Zooarchaeology, history, and landscape archaeology at Finnbogastaðir in the 18th century. Archaeologia Islandica 3:20–46. Fogarty, M., L. Incze, K. Hayhoe, D. Mountain, and J. Manning. 2008. Potential climate change impacts on Atlantic cod (Gadus morhua) off the northeastern USA. Mitigation and Adaption Strategies for Global Change 13:453–466. Gaulton, B., and J.A. Tuck. 2003. The archaeology of Ferryland, Newfoundland until 1696. Avalon Chronicles 8:189–224. Göçer, M., and G. Ekingen. 2005. Comparisons of various bony structures for the age determination of Liza ramada (Risso,1826) population from the Mersin Bay. Journal of Fisheries and Aquatic Sciences 22(1– 2):211–213. Grenier, R. 2007. The “first dig”: Underwater archaeology at Red Bay. Pp. 97–99, In R. Grenier, M-A. Bernier, and W. Stevens (Eds.). The Underwater Archaeology of Red Bay: Basque Shipbuilding and Whaling in the 16th Century, Volume I. Parks Canada, Ottawa, ON, Canada. Gunn, J.S., N.P. Clear, T.I. Carter, A.J. Rees, C.A. Stanley, J.H. Farley, and J.M. Kalish. 2008. Age and growth in southern bluefin tuna, Thunnus maccoyii (Castelnau): Direct estimation from otoliths, scales, and vertebrae. Fisheries Research 92(2–3):207–220. Halliday, R.G. 2002. A comparison of size selection of Atlantic cod (Gadus morhua) and haddock (Melanogrammus aeglefinus) by bottom longlines and otter trawls. Fisheries Research 57:63–73. Harvey, H. 1894. Newfoundland as it is in 1894. Kegan, Paul, Trench, and Trubner and Company, London, UK. Harvey, H. 1900. Newfoundland in 1900. S.E. Garland, St. John’s, NL, Canada. Hind, H.Y. 1877. On the influence of anchor ice in relation to fish offal and the Newfoundland fisheries. Journal of the House of Assembly, Government of Newfoundland and Labrador 39:744–755. Hill, K.T., G.M. Cailliet, and R.L. Radtke. 1989. Comparative analysis of growth zones in four calcified structures of Pacific blue marlin, Makaim nigricans. Fishery Bulletin 87:829–843. Hodgetts, L. 2006. Feast or famine? Seventeenth-century English colonial diet at Ferryland, Newfoundland. Historical Archaeology 40(4):125–138. Hutchings, J.A., and R.A. Myers. 1995. The biological collapse of Atlantic cod off Newfoundland and Labrador: An Exploration of historical changes in exploitation, harvesting technology, and management. Pp. 37–93, In R. Arnason and L.F. Felt (Eds.). The North Atlantic Fishery: Strengths, Weaknesses, and Challenges, Institute of Island Studies. University of Prince Edward Island, Charlottetown, PE, Canada. Journal of the North Atlantic 19 2014 No. 24 M.W. Betts, S. Noël, E. Tourigny, M. Burns, P.E. Pope, and S.L. Cumbaa Jackson, J.B., M.X. Kirby, W.H. Berger, K.A. Bjorndal, L.W. Botsford, B.J. Bourque, R.H. Bradbury, R. Cooke, J. Erlandson, J.A. Estes, T.P. Hughes, S. Kidwell, C.B. Lange, H.S. Lenihan, J.M. Pandolfi, C.H. Peterson, R.S. Steneck, M.J. Tegner, and R.R. Warner. 2001. Historical overfishing and the recent collapse of coastal ecosystems. Science 293:629–638. Jennings, S., S.P.R. Greenstreet, L. Hill, G.J. Piet, J.K. Pinnegar, and K.J. Warr. 2002. Long-term trends in the trophic structure of the North Sea fish community: Evidence from stable isotope analysis, size-spectra, and community metrics. Marine Biology 141:1085–1097. Jones, C.M. 1992 Development and application of the otolith increment technique. Pp. 1–11, In D.K. Stevenson and S. E. Campana (Eds.). Otolith Microstructure Examination and Analysis. Special Publication of Fisheries and Aquatic Sciences, 117. Kenchington, T.J., and E.L. Kenchington. 1993. An eighteenth- century commercial length-frequency sample of Atlantic cod, Gadus morhua, based on archaeological data. Fisheries Research 18:335–347. Khan, M.A., and S. Khan. 2009. Comparison of age estimates from scale, opercular bone, otolith, vertebrae, and dorsal fin ray in Labeo rohita (Hamilton), Catla catla (Hamilton), and Channa marulius (Hamilton). Fisheries Research 100:255–259. Kobashi, T., K. Kawamura, J. P. Severinghaus, J.-M. Barnola, T. Nakaegawa, B.M. Vinther, S. J., Johnsen, and J.E. Box. 2011. High variability of Greenland surface temperature over the past 4000 years estimated from trapped air in an ice core. Geophysical Research Letters 38:L21501. Krivogorskaya, Y., S. Perdikaris, and T.H. McGovern. 2005. Fish bones and fishermen: The Potential of zooarchaeology in the Westfjords. Archaeologica Islandica (4):31–51. Lear, W.H. 1984. Underwater World: Atlantic Cod. Department of Fisheries and Oceans, Ottawa, ON, Canada. Lilly, G.R., P. Shelton, J. Brattey, N. Cardigan, B.P. Healey, E.E. Murphy, and D.E. Stansbury. 2001. An assessment of the cod stock in NAFO divisions 2J+3KL. Canadian Stock Assessment Secretariat Research Document 2001-044. Ottawa, ON, Canada. Lounsbury, R.G. 1934. The British Fishery at Newfoundland 1634–1763. Yale University Press, New Haven, CT, USA. Lyman, R.L. 1994. Vertebrate Taphonomy. Cambridge Manuals in Archaeology. Cambridge University Press, Cambridge, UK. Maschner, H.D.G., M.W. Betts, K. Reedy-Maschner, and A.W. Trites. 2008. A 4500-year time series of Pacific cod (Gadus macrocephalus): Archaeology, regime shifts, and sustainable fisheries. Fisheries Bulletin 106:386–394. Matthews, K. 1968. A history of the West of England– Newfoundland fisheries. Unpublished Ph.D. Dissertation. University of Oxford, Oxford, UK. Moiseev, P.A., 1953. Cod and flounders of far-eastern waters. Izvestia Tikhookeanskovo Nauchno- Issledovatelskovo Instituta Pybnovo Khoziaistva i Okeanografii 40:1–287. Musset, G. 1899. Les Rochelais á Terre-Neuve 1500– 1789. La Rochelle, Paris, France. Myers, R.A. 2001. Testing ecological models: Their influence of catch rates on settlement of fishermen in Newfoundland, 1710–1833. Pp. 13–30, In P. Holm, T. Smith, and D. Starkey (Eds.). The Exploited Seas: New Directions for Marine Environmental History. Research in Maritime History 21, Memorial University of Newfoundland, St. John’s, NL, Canada. Nagaoka, L. 2005. Differential recovery of Pacific island fish remains. Journal of Archaeological Science 32:941–955. Nixon, D.A. 1999. A seventeenth-century house at Ferryland, Newfoundland (CgAf-2, Area B). Unpublished M.A. Thesis. Memorial University of Newfoundland, St. John’s, NL, Canada. Noël, S. 2010. Fishermen’s foodways on the Petit Nord: Faunal analysis of a seasonal fishing station at the Dos de Cheval Site (EfAx-09), Newfoundland. Unpublished M.A. Thesis. Memorial University of Newfoundland, St. John’s, NL, Canada. Orchard, T. 2001. The role of selected fish species in Aleut palaeodiet. Unpublished M.A. Thesis. University of Victoria, Victoria, BC, Canada. Orchard, T. 2003. An application of the linear regression technique for determining length and weight of six fish taxa: The role of selected fish species in Aleut palaeodiet. BAR British Archaeological Reports, International Series 1172. Archaeopress, Oxford, UK. Pauly, D. 1995. Anecdotes on the shifting baseline syndrome of fisheries. Trends in Ecology and Evolution 10:430. Perdikaris, S., and T.H. McGovern. 2007. Cod fish, walrus, and chieftains. Studies in Human Ecology and Adaptation Volume 3:193–216. Perdikaris, S., and T.H. McGovern. 2009. Viking age economics and the origin of commerical cod fisheries in the North Atlantic. Pp 61–90, In L. Sicking and D. Abreu-Ferreira (Eds.). Beyond the Catch: Fisheries of the North Atlantic, North Sea, and the Baltic 900– 1850. Koninklijke Brill, Leiden, Netherlands. Planque, B., and T. Frédou. 1999. Temperature and the recruitment of Atlantic cod (Gadus morhua). Canadian Journal of Fisheries and Aquatic Sciences 56:2069–2077. Pope, P.E. 1997. Early estimates: Assessment of catches in the Newfoundland cod fishery, 1660–1690. Pp. 7–40, In D. Vickers (Ed.). Marine Resources and Human Societies in the North Atlantic Since 1500. ISER Books, St. John’s, NL, Canada. Pope, P.E. 2004. Fish into Wine: The Newfoundland Plantation in the Seventeenth Century. University of North Carolina Press, Chapel Hill, NC, USA. Pope, P.E. 2006. The Scale of the early modern Newfoundland cod fishery. Pp. 9–28, In D.J. Starkey and J.E. Candow (Eds.). The North Atlantic Fisheries: Supply, Marketing, and Consumption, 1560–1900. Studia Atlantica 8, University of Hull, Hull, UK. Pope, P.E. 2008. The archaeology of France’s migratory fishery on Newfoundland’s Petit Nord. Pp. 38–54, In C. Roy and H. Côté (Eds.). Rêves d’Amériques: Regard sur l’Archéologie de la Nouvelle France. Archéologiques, Collection hors Série , Montréal, QC, Canada. 2014 Journal of the North Atlantic No. 24 M.W. Betts, S. Noël, E. Tourigny, M. Burns, P.E. Pope, and S.L. Cumbaa 20 Pope, P.E. 2009. Transformation of the maritime cultural landscape of Atlantic Canada by migratory European fishers, 1500–1800. Pp. 123–154, In L. Sicking and D. Abreu-Ferreira (Eds.). Beyond the Catch: Fisheries of the North Atlantic, the North Sea, and the Baltic, 900–1850. Brill, The Hague, Netherlands. Pope, P.E., and M. Batt. 2008. Post-Medieval Breton earthenwares in Newfoundland. Post-Medievol Archaeology 42(1):48–74. Pörtner, H.O., B. Berdalb, R. Blustc, O. Brixb, A. Colosimod, B. De Wachterc, A. Giulianid, T. Johansene, T. Fischera, R. Knusta, G. Lanniga, G. Naevdale, A. Nedenesb, G. Nyhammere, F.J. Sartorisa, I. Serenderoa, P. Sirabellad, S. Thorkildsenb, and M. Zakhartsevc. 2001. Climate-induced temperature effects on growth performance, fecundity, and recruitment in marine fish: Developing a hypothesis for cause-and-effect relationships in Atlantic cod (Gadus morhua) and common eelpout (Zoarces viviparus). Continental Shelf Research 21:1975–1997. Prince, E.D., D.W. Lee, C.A. Wilson, and J.M. Dean. 1984. Progress in estimating age of blue marlin, Makaira nigricans, and white marlin, Tetrapterus albils, from the western Atlantic Ocean, Caribbean Sea, and Gulf of Mexico. International Commission for the Conservation of Atlantic Tunas, Collected Volume of Scientific Papers 20:435–447. Proulx, J.P. 1979. Histoire et Naufrage des Navires Le Saphire, La Marguerite, Le Murinet, et L’Auguste. Parks Canada, Ottawa, ON, Canada. Quinn, D.B. 1979. A New American World. Vol. 1. America Form Concept to Discovery: Early Exploration of North America. Arno Press, New York, NY, USA. Reiss, M.J. 1989 The Allometry of Growth and Reproduction. Cambridge University Press, Cambridge, UK. Ringer, R.J. 2007. The in situ remains of the 24M Site. Pp. 161–188, In R. Grenier, M-A. Bernier, and W. Stevens (Eds.). The Underwater Archaeology of Red Bay: Basque Shipbuilding and Whaling in the 16th Century, Volume I. Parks Canada, Ottawa, ON, Canada. Roberts, P., S. Weston, B. Wild, C. Boston, P. Ditchfield, A.J. Shortland, and A.M. Pollard. 2012. The men of Nelson’s navy: A Comparative stable isotope dietary study of late 18th-century and early 19th-century servicemen from Royal Naval hospital burial grounds at Plymouth and Gosport, England. American Journal of Physical Anthropology 148(1):1–10. Rochet, M-J. 1998. Short-term effects of fishing on lifehistory traits of fishes. ICES Journal of Marine Science 55:371–391. Rojo, A. 1986. Live length and weight of cod (Gadus morhua) estimated from various skeletal elements. North American Archaeologist 7:329–351. Rojo, A. 1987. Excavated fish vertebrae as predictors in bioarchaeological research. North American Archaeologist 8:209–226. Rojo, A. 1990. Faunal analysis of fish remains from cellar’s cove, Nova Scotia. Archaeology of Eastern North America 18:89–108. Rojo, A. 2002. Morphological and biometric study of the bones of the buccal apparatus of some Nova Scotia fishes of archaeological interest. Curatorial Report 96, Nova Scotia Museum, Halifax, NS, Canada. Rose, G.A. 2004. Reconciling overfishing and climate change with stock dynamics of Atlantic Cod (Gadus morhua) over 500 Years. Canadian Journal of Fisheries and Aquatic Science (61):1553–1557. Rose G.A., 2005. On distributional responses of North Atlantic fish to climate change. Journal of Marine Science (62):1360–1374. Ruzzante, D.E., J.S. Wroblewski, C.T. Taggart, R.K. Smedbol, D. Cook, and S.V. Goddard. 2000. Bay-scale population structure in coastal Atlantic Canada in Labrador and Newfoundland, Canada. Journal of Fisheries Biology 56:431–447. Ryan, T.D. 1986. Fish Out of Water: The Newfoundland Saltfish Trade 1814–1914. Breakwater, St. John’s, NL, Canada. Shin, Y-J., M-J. Rochet, S. Jennings, J.G. Field, and H. Gislason., H. 2005. Using size-based indicators to evaluate the ecosystem effects of fishing. ICES Journal of Marine Science 62(2005):384–396. Sinclair, A.F., and S.A. Murawski. 1997. Why have groundfish stocks declined? Pp.71–83, In J. Boreman, B.S. Nakashima, J.A. Wilson and R.L. Kendall (Eds.). Northwest Atlantic Groundfish: Perspectives on a Fishery Collapse. American Fisheries Society, Bethesda, MD, USA. Spiess, A.E., and R.A. Lewis. 2001. The Turner Farm fauna: 5000 years of hunting and fishing in Penobscot Bay, Maine. Occasional Publications in Maine Archaeology 11. Maine State Museum, Augusta, ME, USA. Starkey, D.J., and M. Haines. 2001. The Newfoundland fisheries, c. 1500–1900: A British perspective. Pp. 1–11, In P. Holm, T. Smith, and D. Starkey (Eds.). The Exploited Seas: New Directions for Marine Environmental History. Research in Maritime History 21, Memorial University of Newfoundland, NL, Canada. Stevens, W., and S.L. Cumbaa. 2007. Marine archaeology and zooarchaeology of the 16th-century whaling harbour of Red Bay. Pp. 189–200, In R. Grenier, M-A. Bernier, and W. Stevens (Eds.). The Underwater Archaeology of Red Bay: Basque Shipbuilding and Whaling in the 16th Century, Volume I. Parks Canada, Ottawa, ON, Canada. Sundby S. 2000. Recruitment of Atlantic cod stocks in relation to temperature and advection of copepod populations. Sarsia 85:277–298. Svedäng, H., D. Righton, and P. Jonsson, P. 2007. Migratory behaviour of Atlantic cod, Gadus Morhua: Natal homing in the prime stock-separating mechanism. Marine Ecology progress Series 345:1–12. Swain, D.P., A.F. Sinclair, and J.M. Hanson. 2007. Evolutionary response to size-selective mortality in an exploited fish population. Proceedings of the Royal Society 274:1015–1022. Journal of the North Atlantic 21 2014 No. 24 M.W. Betts, S. Noël, E. Tourigny, M. Burns, P.E. Pope, and S.L. Cumbaa Tourigny, E. 2009. What ladies and gentlemen ate for dinner: The analysis of faunal materials recovered from a seventeenth-century high-status English household, Ferryland, Newfoundland. Unpublished M.A. Thesis. Memorial University of Newfoundland, St. John’s, NL, Canada. Trippel, E.A. 1995. Age at maturity as a stress indicator in fisheries. BioScience 45:759–771. Tuck, J.A. 1982. A sixteenth-century whaling station at Red Bay, Labrador. Pp.41–52, In G.M. Story (Ed.). Early European Settlement and Exploitation in Atlantic Canada. Memorial University of Newfoundland, St. John’s, NL, Canada. Tuck, J. A. 1983. Excavations at Red Bay, Labrador–1982. Pp. 95–117, In J.S. Thomson and C. Thomson (Eds.). Archaeology of Newfoundland and Labrador 1982: Annual report No. 3. Historical Resources Division, Government of Newfoundland and Labrador, St. John’s, NL, Canada. Tuck, J.A., and R. Grenier. 1981. A 16th-century Basque whaling station in Labrador. Scientific American 245(5):180–190. Turgeon, L. 1995. Fluctuations in cod and whale stocks in the north Atlantic during the eighteenth century. Pp. 87–121, In D. Vickers (Ed.). Marine Resources and Human Societies in the North Atlantic Since 1500, 1995. Institute for Social and Economic Research, Memorial University of Newfoundland, St. John’s, NL, Canada. Van Neer, W., L. Lougas, and A.D. Rijnsdorp. 1999. Reconstructing age distribution, season of capture, and growth rate of fish from archaeological sites based on otoliths and vertebrae. International Journal of Osteoarchaeolgy 9:116–130. Wheeler, A., and A.K. Jones. 1989. Fishes. Cambridge University Press, New York, NY, USA. Wilson, R.R., Jr. 1982. A comparison of ages estimated by the polarized-light method with ages estimated by vertebrae in females of Coryphaenoides acrolepis (Pisces: Macrouridae). Deep-Sea Research 29(11A):1373–1379. Endnotes 1We note that Red Bay is located 70 km west of the 3K NAFO region and is technically in the 4R NAFO region; however, given its close proximity to the study area, this boundary can be considered artificial for comparative purposes.